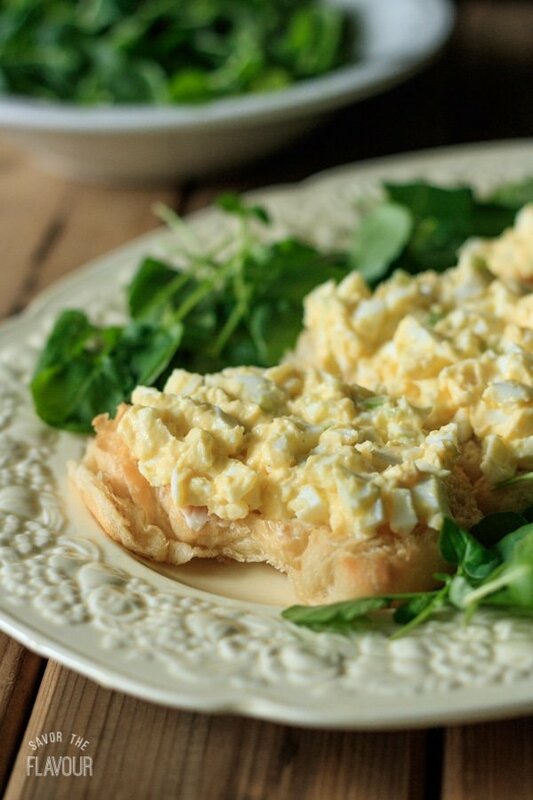 This is an easy recipe for a classic egg salad sandwich! 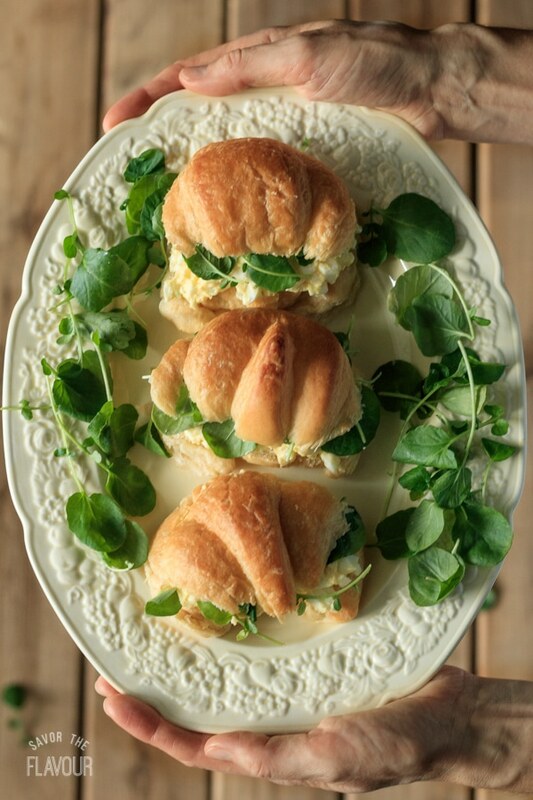 The traditional English addition of watercress perfectly complements the creamy egg filling. These popular sandwiches are a family favorite for lunch, and would make a delightful addition to a tea party or baby shower. 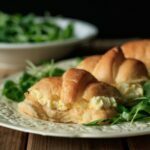 My girls love eating a classic egg salad sandwich for lunch! I’ve been making them for over 20 years, and this recipe will put a big smile on the face of the recipient. 😊 Both Busy Baker 🍞 and Bookworm Beth 📚🐛 will never pass up the opportunity to dig their teeth into one of these beauties. Pressed for time at noon? Just make the egg salad the night before. Serving it on a fancy French croissant elevates this classic sandwich to a whole other level. If you want a British touch, add watercress. Not only will it heighten the flavor, it will give you a good dose of vitamin K. If you are watching your calories, leave off the top of the croissant. 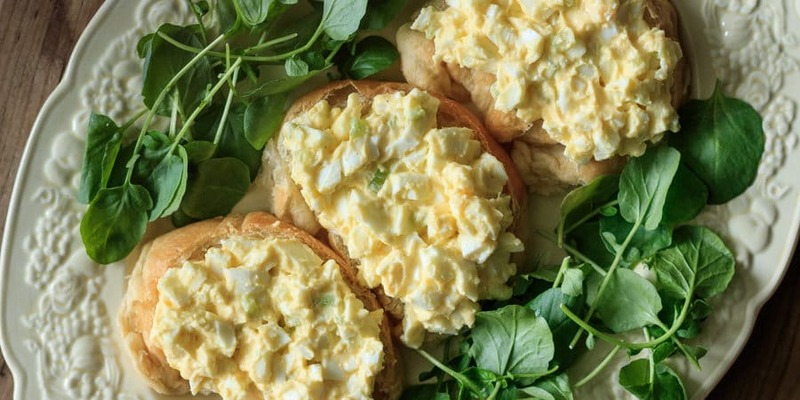 Egg salad sandwiches are also high in protein, so they are a wonderful choice to serve at lunch. Pair this up with a French carrot salad, and you’ll have a menu that is sure to please! Fill a medium saucepan halfway with water. Cover and bring to a boil. Once boiling, turn the heat down to medium-low and carefully lower the eggs one at a time with a spoon into the hot water. Keep the lid askew and cook for 10 minutes. Drain the hot water out of the pan. Pour cold water over the eggs to help them stop cooking. Set aside to cool. While the eggs are cooling, wash and mince the celery. Measure out the salt, white pepper, onion powder, and the mayo. Once the eggs are cool enough to handle, peel and chop them. Place in a medium bowl. Add the mayo and spices and stir well to combine. Adjust seasonings to taste. This is a good place to stop if you want to make this in advance. Just cover the egg salad, and store in the fridge. Slice the croissant in half lengthwise. On the bottom half, spread the egg salad. Scatter the watercress on top of the salad and put on the top half. Serve immediately. Any leftover egg salad should be covered and refrigerated. Feel free to omit the celery, if you like your egg salad very smooth. Watercress tastes peppery, a little like radishes. Its flavor compliments the egg salad wonderfully, and makes an excellent choice for health reasons, as it is very high in vitamin K.